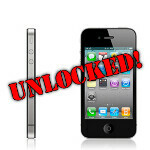 Unlocked iPhone 4 pricing to start at $649? Yesterday, we reported the rumor that the iPhone 4 may be coming to stores near you this week unlocked, meaning you could buy the phone without a contract and theoretically use it on any carrier. Today, those rumors are picking up steam and adding a new element: pricing. The new info puts the pricing at $649 for a 16GB iPhone 4 and $749 for a 32GB model. The word is that the phones have already been shipped to Apple Stores and could see the shelves this week. Unlocked iPhone 4 sounds good in theory, but it's in practice where things get itchy. There's a possibility that these unlocked iPhones will come in CDMA or GSM versions, allowing customers to use the phone on any American carrier as long as they provide their own SIM card (on T-Mobile or AT&T) or pay any activation fees (for Verizon or Sprint). Of course, knowing Apple there is a much better possibility that the unlocked phones are still only usable on AT&T or Verizon, but not Sprint or T-Mobile. Either way, an unlocked iPhone would be great for international travelers, because you'd finally be able to swap out SIM cards when traveling and save some money. well idk why anyone wud buy it for this price... it costs 200 + 320 early termination fee from att... thats a good 120 less.. I guess you don't travel. Your logic is narrow sighted. 200+320= still a locked phone. Stay in Jail, do not pass go. Jailbroken 4.21 baseband 3.10. Maybe you are better than the Dev team and can unlock it for me. Been waiting since October 2010. Any more ideas genius. ......an unlocked iPhone would be great for international travelers, because you'd finally be able to swap out SIM cards when traveling and save some money. I guess average Americans like Sarah Palin won't appreciate this in their lifetime. What country are you talking about. I have an unlocked Android and what you are saying is totally off base. It is cheaper to buy an unlocked phone and add credits and data as you need. Have anyone ever figured the total cost of ownership of a contract phone. Let me give you an idea.Let's take t-MobileCost of phone $200Domestic Plan +/- $80.00 mth X 24=$1920You are up to $2120. Now start adding roaming outside of the US and other charges. Yes I paid $600 for unlocked Android and $750 for my unlocked Iphone, but I don't use no where close to $1500 in credits over 2 years in all my travels and I am not in jail for 2 years.Everyone's circumstances are different. For me Unlocked is always my best option.